Iris also likes water. She loves to gaze at it, watching fish swim or seaweed drift is particularly fine, but any combination of water and movement will do. If she's quenched her most desperate thirst she'll find herself succumbing to an equally desparate urge to watch the water in her cup dripping, splashing, pouring. 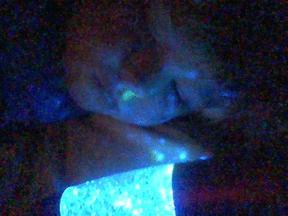 Iris likes to go to sleep holding her sparkly light. It was was a birthday present, it's beautiful, safe, soporific, and scientifically interesting. The bottle part has glitter in the water and when it's tipped it starts a blue, a red and a green diode alternating for a minute or so. The glitter reflects the diodes' light as it slowly turns in the convection currents. She tips it, watches it and closes her eyes, tips it, watches it and closes her eyes, finally she can't be bothered opening her eyes or tipping it any more. My father does fluid mechanics, particularly of drops and bubbles, I wonder whether he too was fascinated by watching water when small. We'd like a loo under our stairs, an internal door to the flat below us, a small change in the kitchen bench and a skylight or two over it. Some velvet morning when we're in the black we'd also like to reorganise the back of the house. The council would like a fireproof ceiling downstairs and probably wouldn't give us any permits to do anything unless they start with that. They're right, even the second loo wouldn't give us much joy if a tenant burnt the house down, but it adds about ten thousand to any project. The council must want us to have a holiday in Fiji rather than rush into any alterations, except possibly the bench; or maybe it's that the house would like us to get the deluxe expensive restorer of weather-tightness person to paint it so that it doesn't have to worry about leaking on anything new. After dinner Sean took the kids to the pool to wear them out and give me a bit of peace for Playcentre work. Hazel put her new goggles on and determinedly threw herself into learning to swim. She spluttered, gasped, choked and gagged but kept on working and came home triumphantly aquatic. She's managed to reliably get herself through the water without touching the bottom! What a brilliant tenacious mer-child! Sean was at work and I was there when Hazel learnt to walk (straight towards a full-length mirror basking in self-love the whole way), it's only fair that he was there and I wasn't for this. I wrote what was to be here while sitting in a cool breeze in the car park with Iris asleep in her seat. Happy to be living in the future, I wrote it on my phone and multi-media-messaged it to here, or somewhere. Alas, it has vanished into the ether; if I'd learnt from the past I'd've used pencil and paper and now be able to type it in. In science fiction devices work or they fail spectacularly. Although our heroine's BEE keeps falling on her head in Tanith Lee's teenage dystopia Biting the Sun that is not the future I intended to create. Funny Jim. Jim big. Jim like wet knees. Jim bouncing. White face! Little teeny weeny camel dancing. Little teeny weeny camel bouncing, round and round! Big rabbit bouncing? No... 'paca! Hazel was intrigued that Jim, who can drink out of the hose, did not do so while we were there, despite the heat. He does have a creek through his paddock. Having seen how happy wet knees made the alpacas and llama we went to the pool and frolicked ourselves. Hazel wore goggles and kept peering at things under the water, and then inveigled me into a complex game in which mermaids rescued a prince from pirates, borrowed a trident from the sea king and put the pirates to death, but the flutterboard that was standing in for the pirates (one after the other) wouldn't stay in its watery grave so we had to make some trouble for the zombie pirate flutterboards. Today Hazel had a near perfect summer day: clear skies, Chocolate Fish cafe for delicious food, wading in the sea, finding a pack of slightly older girls and adventurously exploring rocks near the lapping waves as the tide encroached with them, me reading her the riotous bacchanal at the end of Prince Caspian to her while Iris slept, and she's out tonight with Sean seeing a band in the botanical gardens. Iris didn't have as great a day, she was wakeful last night and while she did enjoy the beach she woke from her afternoon sleep very hot to the touch and terribly unhappy. My day varied with their days. I loved the beach, though Iris was a bit clingy. I was enlightened when the doctor said "Ears" and "Augmentin". This evening, as Hazel and Iris ate dinner outside with Edward. While Sean talked to the expensive, but we hope very thorough, painter. I drove tensely around and around in rush hour suburbia looking for an open chemist thinking about Edward's and my great uncle Francis Skinner. Francis fell in with an extreme crowd at university and dropped out to live in a scuzzy flat and work in a factory, probably because he and his beloved Wittgenstein thought that living in the Real World rather than academia was an important part of his education. He caught TB or something and died, during, but not in, the war. He down-played how sick he was and wouldn't hear of his parents visiting because it was just after Cambridge got bombed. My great-grandmother held Wittgenstein somewhat responsible for Francis's death, after all, he was supposed to be the lecturer in the group. After Francis died Wittgenstein asked the family burn his letters unread, and they did. They asked him to burn Francis's in return, but he didn't. I think he missed Francis too much to burn them. The asymmetry and subsequent publishing of some of Francis's letters probably would have much annoyed my great-grandmother, but I'm glad of it. After my masters degree, when I was dropping out of philosophy myself I found reading my great-uncle grappling with the same torrid affair with the same subject was a wonderful relief and justification. In his passionate and loving letters to Wittgenstein, Francis voices and re-voices the intention to keep thinking philosophical thoughts and remain able to speak his mind on complex matters. Stopping and starting up the hill in a queue of cars I was wondering if that is partly what this blog is for, making sure I don't lose vocabulary, concepts, or written modes of expression through disuse, am I worried that the sparkling seaside full of wise children's advice could be a factory to me? "Don't touch coloured jellyfish, they sting. The clear ones with a little white are safe." PS There's a quite likely more accurate story about Francis Skinner on wikipedia, same tropes, almost entirely different details. "All true wealth is biological"
Edward is back, he's my cousin and staying with us while flatless. Ed's made of stories and strange facts. Even though he's so jet lagged he's hardly here yet already I've had half a tale about stealth bomber test pilots' sleep cycles. Also, my mother brought two of my kids' cousins over and they were all lovely to each other. Having even one cousin around makes me feel rich because mine were all english and growing up here my life seemed lacking in them (Edward is nouveau-kiwi). My kids are far richer, they have 5 cousins in Wellington. (The quote's from Lois McMaster Bujold via Cordelia Naismith Vorkosigan). I just looked out my window, I had no idea. The wind is playing loud, the lighting is freaking out with purpley-grey clouds scudding past orangey-pink ones, and the trees are in the mosh pit. In some theories a definite description does the same work as a name. So, if when my friend Gillian mentions her friend Gary Hardcastle I ask "is he the one with the kid like Calvin who did the box?" what does he ask when she mentions me? Surely not anything as dull as "is she the New Zealander?" from someone who's written Monty Python and Philosophy (like the combination of ideas? Try this 1993 talk). Oh, about the box, well, I might get it wrong, but I think it goes like this... in order to show the students of a Philosophy of Science course what being a scientist is really like he got his kids to fill a box with varied junk and then totally sealed it. Nobody knew all of what was in the box when he took it to his class and asked the students to try to find out what was in the box without opening it. They shook it, weighed it, x-rayed it, interrogated his kids (I hope the one billed as being like Calvin lied), and got some pretty good theories. At the end of the course he took the box to the dump without opening it. No scientist gets to open the box. The wind's still playing loud, I presume there are black low clouds scudding past black high clouds and black trees still flailing as they dance, but it's a goth gig and I can't see anything but the exit lights near the loo from my window. Taking a break from the play-force. They're right you know, biology is imperative. Not that I felt a command to sprog, in fact I fully expected to live in a hundred American university towns as a dinky geek-hedonist (that would be having the money to buy games and techy toys at the same time as having the time to play with them). Things changed, living in New Zealand we decided to give conception a whirl. Being pregnant got me all the approval I could possibly desire from the families involved, but it made me sick and tired. Then a really great, intense, and carefully characterised game started lacking party cohesion (i.e. got a bit nasty), and I went to a Mega-Roleplaying weekend whose Larp included a couple of people arguing and weeping about character issues and I could so see where both of them were coming from. I decided to take a break from role-playing. Biology's imperative came later, during gestation the foetus had turned into a little daughter who trumped all other priorities. When I got enough time to do something as well as parent we chose that it be gestating again (theory being a two year gap would be hard work and pay off fast, and it really was and it seems to be). So I hadn't role-played for four years. Well, not formally, with adults, I've been story-telling and playing pretend heaps, which is probably why, in my newly refound spare time, I've been knitting, working on playcentre training, and now a reading group rather than role-playing. But Kapcon's reminded me how much I like it, in fact I've been thinking I'd like to spend my dotage role-playing; get up in the morning, dress, hobble the walking frame down to the dining hall for breakfast and then spend the morning pretending to be healthy and adventurous in a wild world, lunch, nap with book and heroic dreams, dinner, and then potter about with the computer plotting and so forth during the wakeful parts of the night. It would make it easier if a fair few role-players go to the same nursing home, I guess we'd be likelier to choose one with a name like... The Golden Pegasus Home for Retired Adventurers. But why wait, I've been fondly reading other people's Kapcon memories and my inner walrus is saying that the time has come again for cabbages and kings. Now I just need to find some spare time. I can hear the music of two neighbours, one is rock ballad baseline and the other probably a flute concerto, together it's quite trip-hop-ambient. Meanwhile the sky turns yellow with dusk and other people who can be bothered getting up light their lamps for the evening and spangle the hills. Hazel sleeps with White Bear almost every night. Tonight she's sleeping with Dad's Bear instead. He won't mind if she borrows it because, were he to come home, he'd get to sleep with me, the computer, a bushel of clothes and five books, besides, she insisted he take her newest Fairy Barbie to Kapcon. I do hope he ended up in one of those games where your character is someone like you and they have just what you have when they get dimension doored to High Fantasytopia or wherever. How did Kapcon go? Today I only played one game, Ace of Spades, and it was a bit too giggly. But I won a prize! It was for yesterday's repressed dwarf, I'm rather pleased as I know I did that dwarf well and it's been so long since I role-played that winning a prize (GURPS Traveller, thank you Mr. Jackson) is wonderfully validating, whatever strange chances really made it happen. A psyche's holiday is being other people. My parents-in-law have been in my house, their presence has dropped a stone of order into our pool of chaos and calm spread out in ripples, everything is tidier than when I left this morning and there is a new clothes line at thigh height for when children want to help with the washing. They say that Hazel's been taking the dolls' house people to Narnia and Iris has been putting babies to bed. Meanwhile I've been playing pretend with adults. In A Cruise in the West Indies I was an ambitious Napoleonic wars English naval lieutenant, now well on the road to a promotion because of lucky dice rolls and personal heroism. In The Golden Pegasus Home for Retired Adventurers I was a retired dwarven warrior, who managed to not only finally come out as a female to the hero she has had a crush on forever, but also restore his youth and vigour. And in Paranoia: The Dark Ages I was a heretical dark-ages novice who survived rather than advanced but she did get to ride her scrummy pony a lot. I met old friends and laughed hard. I look up the recipe every time I boil an egg. 1. No two of the the four are more than 10 feet apart. 2. The total length of the counter - excluding sink, stove, and refrigerator - is at least 12 feet. 3. No one section of the counter is less than 4 feet long. There is no need for the counter to be continuous or entirely "built in" as it is in many modern kitchens - it can even consist of free-standing tables or counter tops. Only the three functional relationships described above are critical. I haven't measured my kitchen, but I feel that it's in many ways the easiest I've ever lived with and certainly it has the proximity. I suspect it only gets to 12 feet of counter if I count the table as part of it and that's not in the workspace bit. One of the things I love about it is that it's kind of D shaped so that the kids rush past along the straight upright of the D and I stand in the fat tummy of the D and putter away. I've been surprised at how well the kitchen works because it looked little compared to our old one. Does it make me cook any more or better? Well, probably not, but perhaps less grumpily. I've no idea what I used to cook before fresh Tortellini was available. I vaguely remember I used to make sauce as well as pasta. Going in the front door should be a no-brainer. Visiting Sharon's house for the first time today I walked around her house the wrong way and into the back door. The front door is hidden from the gate by a seventies sun-room and has a fairly secret path under a big tree compared to the young highway to the back door, so I'm sure she's not just trying to make me feel better when she says that lots of people make the same mistake. Our last house also had guests confused but not because they couldn't see the door. It was that the front door was a sliding door at the top of a few plank stairs and led into a eighties sun-room. It didn't look proper enough. The functional problem which guides the placing of main entrances is simple.The entrance must be placed in such a way that people who approach the building see the entrance, or some hint of where the entrance is, as they see the building itself. This makes it possible for them to orient their movements toward the entrance as soon as they start moving toward the building, without having to change direction or change their plan of how they will approach the building. Place the main entrance of the building at a point where it can be seen immediately from the main avenue of approach and give it a bold visible shape which stands out in front of the building. Sharon plans to change where the gate is in her fence to be straight in front of the door and put a really obvious path between them. To fix our old house's secret front door problem we started by putting lounge furniture and push-chairs in the visible sun room which made it seem like an appropriately public room for a front door to go in to (see also Intimacy Gradient), a doorbell and house number on the wall by the door, plants on the stairs and a garden beside the path (to add to the formality of the stairs), and ended up with adding a whole porch (see also Entrance Transition). We were very fond of that house and we meant to live there longer than we did, but we got a bit more money coming in and started to find ourselves at open homes most weekends. To those open homes I took a list of the patterns I didn't want to live long without. 104 Site Repair - build on the worst land so the best land is still land not building. 105 South Facing Outdoors - excuse their hemisphere parochiality, they mean Sunny Outdoors. 107 Wings of Light - fat houses don't get enough natural light into their middles, long and thin is better. 110 Main Entrance - going in the front door should be a no-brainer. 112 Entrance Transition - when you arrive it should be a process not sudden. 113 Car Connection - if you arrive by car you should still get a nice transition. 127 Intimacy Gradient - spaces in a building should be accessible in order of publicness, we don't want to walk through the bedroom to get to the lounge. 130 Entrance Room - there should be a place that is the place where one changes from being outside to being inside. 131 Flow Through Rooms - shared rooms should be part of the way to get to other rooms. 139 Farmhouse Kitchen - it's nice to be able to make meals sociably. 159 Light On Two Sides of Every Room - well, every shared room, if you have windows on just one side of a room it makes one person in silhouette and the other with the sun in their eyes. This makes it hard to talk. 160 Building Edge - it should be a usable space. 161 Sunny Place - the sunny side of the building should have a place to hang out. 163 Outdoor Room - somewhere to do the things we do inside but outside (e.g. eat, read, talk). 167 6' Balcony - any smaller than 2m x 2m and you can't fit a conversational group on it. 180 Window Place - a spot by a window to sit. 200 Open Shelves - so you can see what's on them. 236 Windows Which Open Wide - to let the air right in. 247 Paving With Cracks Between the Stones - so things grow through. 251 Different Chairs - not a suite that fits one person well and the rest cope with but different chairs for different bodies and moods. 253 Things From Your Life. Often one part of a building realises more than one of the patterns. Our house has a sunny little back garden with a table, a climbing frame, the compost bin, a shed, some lawn and some bricks. It is our courtyard which lives, our building edge, our sunny place, our outdoor room, our 6' balcony, its sliding door is our window which opens the widest and its bricks are our paving with cracks between the stones. It gets a lot of use. Oh blast, the cat has a rodent squealing under Hazel's bed. Off to be heroic. Bad weather, glad I'm not homeless tonight. But the thought that things could be so very much worse hasn't fixed everything here; Iris says "breastfeed not working" and is thirstily wakeful. I'm having a cup of tea and trying not to feel failure. Maybe she'll be asleep before I swig the dregs, maybe this is the end of four years feeding. I can but wait and see, they tell me tomorrow is another day. ... and after the cuppa and a bit of mammalian gazing at the young animal and grooming her fur apparently my pituitary gland realised what was going on and produced the right hormones. She's trying very hard indeed, she dreamt of swimming and woke believing she could swim, now she feels the fear and sticks her head in the water anyway, she kicks and sinks and jumps up from the bottom and in triumphant splutters tells me to watch her again. I watched her carefully and while I did so her little sister sunk. There's nothing like the high of rescuing your own selfish genes from the vasty deeps of a local pool. I grabbed the back of her togs and the big sister suddenly came over all needy because when one sees something demonstrated (even parental love) it's so much more desirable than half a second before. These last couple of days I've been reading Annie Lamott's Operating Instructions again, and again it's revived my interest in writing a diary, so here we all are.